Any individual traveling from an international location into Nashville will need to check the U.S. Department of State website to verify their specific country VISA requirements: travel.state.govAttendees requesting an invitation letter for visa processing must send their registration confirmation email to papers@nace.org. NACE International is providing shuttle service between the Nashville Music City Center and selected CORROSION 2019 hotels. This service is only for attendees and exhibitors staying at the selected official hotels. Transportation will begin on Sunday, March 24, and continue through Thursday, March 28. Detailed schedules will be posted in the CORROSION 2019 Final Program, at the official hotels, and in the convention center. Don’t forget that you can earn PDH by attending: technical meetings, forums, and symposia. All you have to do is printout your personalized PDH Certificates at the PDH station located near Registration. Certificates are based solely on the information you provide NACE at the time of printing. Please note that PDH hours are not given for Networking Events. NACE staff will be available to help you with directions or answer general conference questions. The kiosks will be located at the entrance of the convention center near the shuttle drop-off. We have partnered with United Airlines to offer travel discounts to CORROSION 2019.Visit united.com/meetingtravel and enter code ZGHW766528 in the offer code box. You may also call United Meeting Reservation Desk at 800-426-1122 Monday through Friday 8 a.m. to 10 p.m. ET and Saturday and Sunday from 8 a.m. to 6 p.m. ET. Booking fees are waived for meeting reservations. Please note that travel must be booked between March 15 and April 2, 2019 in order to receive the discount. Looking for a particular corrosion title? Visit the NACE Store where you can browse through corrosion-related resources and purchase at a member price while avoiding shipping fees. The NACE Store will be located in the main corridor before you enter the Exhibit Hall. The Corporate Access Lounge offers qualifying corporate member representatives specialized service and an oasis for conducting business while at conference. Reserve meeting rooms, check email on your computers with Internet access, or just relax between meetings. The Diamond Access Lounge will have extended benefits for qualifying Diamond Corporate Member representatives, offering additional services. Learn how you can become a corporate member of NACE International today. Please contact our corporate membership coordinator at 1 800-797-6282 U.S./Canada, or +1 281-228-6282 worldwide, or visit nace.org/corporate-membership. The dress code for all official conference activities, excluding the NACE Honoree Night, is business casual. Attire for the NACE Honoree Night is business dress. This is YOUR chance to ride away on a Harley Davidson in Nashville! 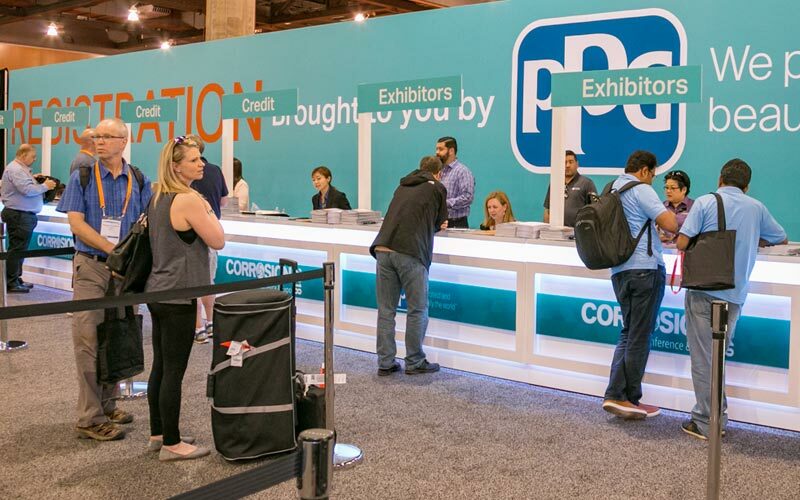 Simply visit each “High Rollin' for a Harley” sponsor at CORROSION 2019 and collect a playing card at each sponsoring booth. Once playing cards have been collected from all sponsors, hightail it over to the Harley on the Exhibit Hall floor, and complete the submission card to enter to win. Return to the Exhibit Hall on Thursday at 10:30 a.m. to see if you've won! While you are checking out our vendors, don’t forget to come by the NACE Booth and update your profile information to receive your custom NACE 2019 lapel pin. Please remember, you will need to know your username and password for your account to update your profile. Need help with your login information? Visit Nace.org to reset your password. We look forward to seeing you there!